Minister Kevin ‘Boxer’ Moran T.D. announces free admission for children under 12 to OPW Heritage Sites from 1st July 2017. The Minister of State for the Office of Public Works and Flood Relief, Kevin ‘Boxer’ Moran T.D. today, June 28th, announced that all children under 12 will be admitted for free to all Heritage Sites managed by the OPW Heritage Service. This initiative will commence on Saturday the 1st of July and will ensure that all children under 12 will have an opportunity to visit these sites for free with their families during the holiday period. The OPW offers free access to all school-going children under their Free Schools Visits programme and about 80,000 children availed of this during 2016. This Programme is intended to support the educational curriculum and children can, with their teachers, engage with many relevant aspects of their learning including art, history and social science at these historic & heritage locations throughout the country. The initiative will apply to all paid-admission sites operated by the OPW from Saturday the 1st of July 2017. 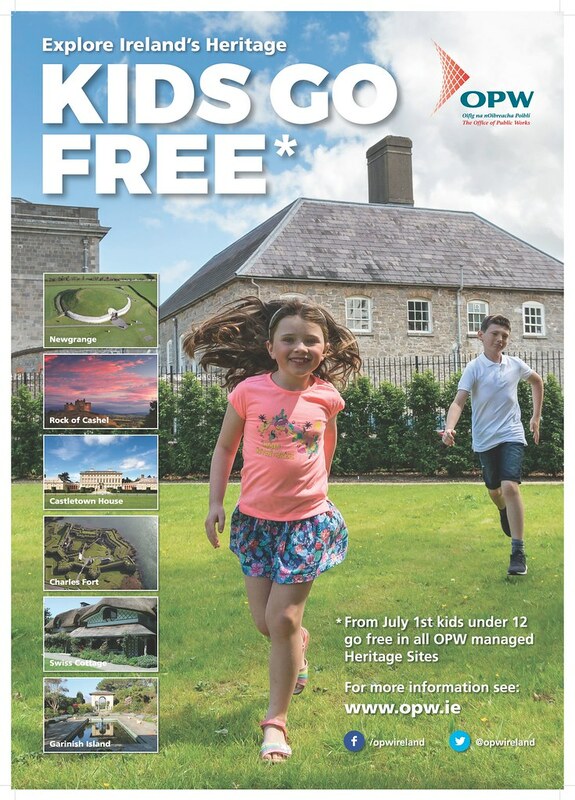 List of Fee paying OPW managed Visitor Sites where children under 12 go FREE.